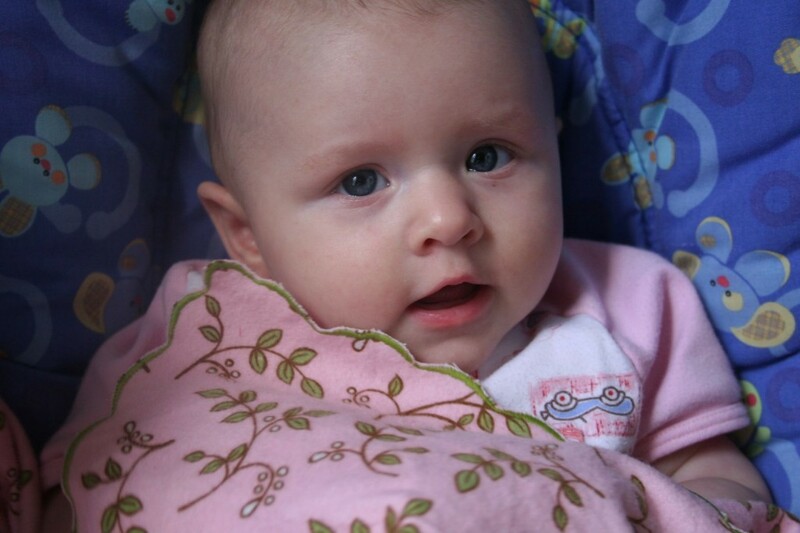 When our second baby was born, she was gifted with two really amazing swaddling blankets. One of those is now her woobie, and the other was handed on to her younger brother and now to our youngest. Who loooooves it. Seriously–she’ll sleep without it, but she’s not that enthusiastic, whereas if we swaddle her up in her giant blanket, she’s out like a light. Other blankets are OK, but this baby is long and plump, so smaller flannelette blankets don’t really cut the mustard. Huzzah! A simple, large, square swaddling blanket from soft, soft cotton flannel in a sweet pink print. To jazz things up a bit, I added a scalloped edge. I’m a sucker for a scallop. These scallops are made using the specialty stitch on my sewing machine, around the very edge of the fabric. Now, true confession: it took a minute to do the stitching. Or two. It took a minute or two. But how sweet does it look? So sweet. To make the edge look store-bought, go back with small, very sharp scissors and trim super close to the outer edge of the stitches–as close as you can get without going through the threads. This creates a clean, professional scalloped edge that makes you look like a rock star, and makes a truly lovely (very easy) shower gift. Baby looks like she’s ready for her nap. Swaddle, baby, swaddle. 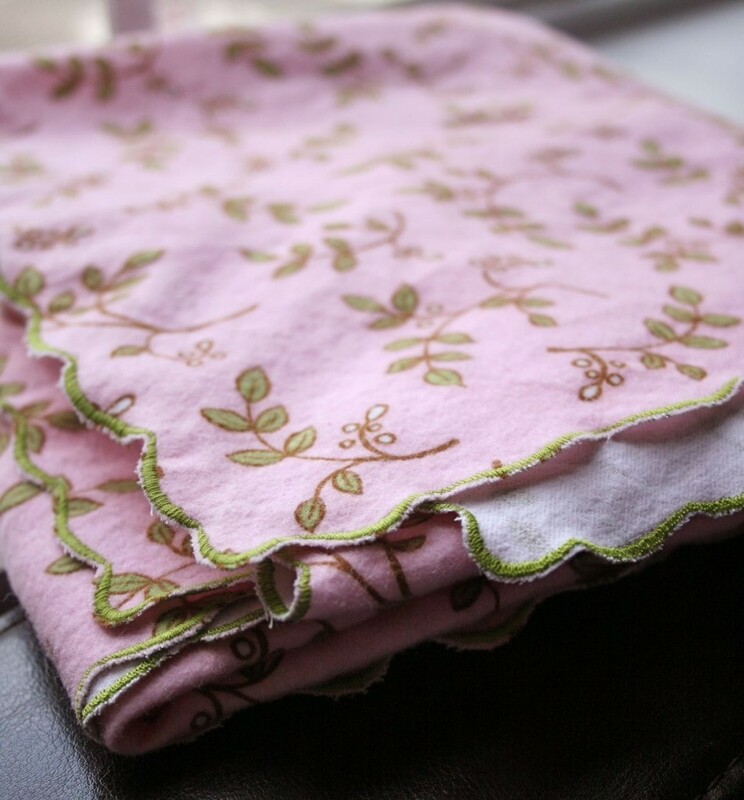 Project details: Made with 1.25 yds Urban Blooms flannel. 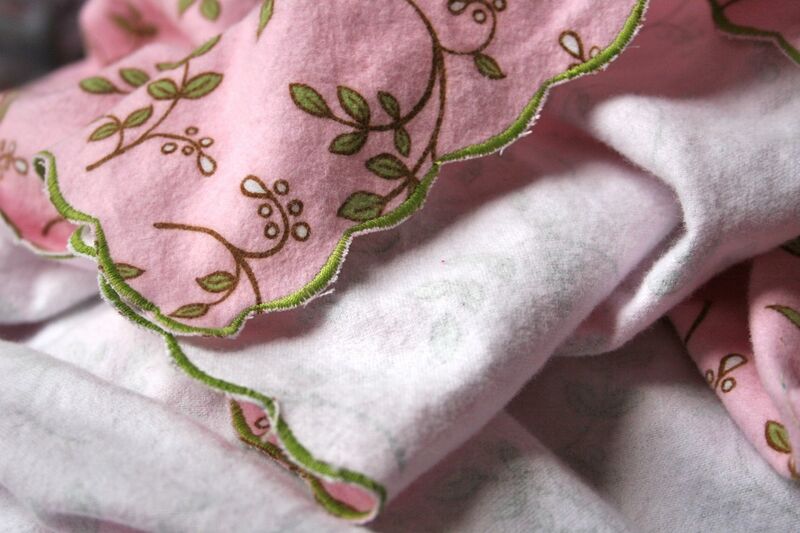 Could use any 45″ flannel (1.25 yds=45″ x 45″ wide is a big, square blanket perfect for swaddling). 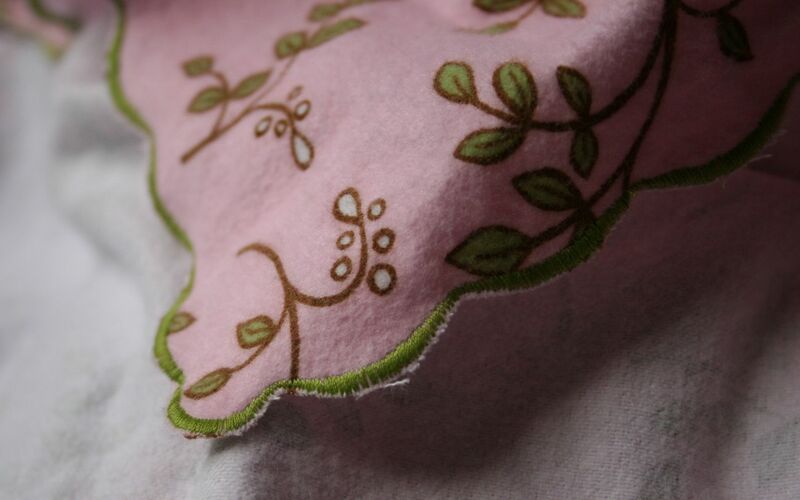 Scallop stitch is set to machine defaults, but any satin stitch would do the trick. oh this is so darling and simple. I’ve never thought to do that. Love it Deb! Lovely blanket, just the perfect thing for my little one since the AC is getting a bit too cool. Thanks! I like that it looks much more difficult and complicated than it is. And these flannels that are out now are sooooo soft and wonderful–we’re using the stink out of this blanket around here!